Imagine that you sit in your self-driving car and instruct it to drive back home. While you relax in your car and let it to automatically find the best route to take you back home, it also send a signal to your cell phone about it and your cell phone checks the current temperature at your home, your Ideal temperature, calculates the difference and the time it takes to bring it up or down to your preferred temperature. At the right time, you cell phone sends signal to your thermostat to start cooling/heating, not only to bring it to the ideal temperature by the time you reach home but also to save the power. When you reach your home, the car sends a signal to the automatic garage door opener to open it and the motion sensor in your garage realizes that you came out of your car and switches on the lights in your hall way. If you happen to sit in your couch the sensors in the couch sends signals to your TV to switch it on and flips your set top box to your favorite channel. Welcome to the world of IoT, “The Internet of Things”. It’s the technology trend that is making waves and is bound to cause major disruption in the coming years. Very simply, it involves machine to machine or device to device communication, aided by data gathering sensors that feed into real time data analysis platforms on the Cloud and provide a “smart” response. The entire technology is mobile, virtual and online, through the internet. So, in our example above, sensors attached to the various devices communicate with each other enabling real-time responses. So, IoT is truly at the intersection of technologies related to Electronics & Communication, Mobile, Web, Cloud and Data Analytics. Most of the technology described above is already available in the market or under different stages of testing. According to Mr. Bakta, we are not too far away from adopting IoT in our daily routine. Various studies indicate that anywhere between 20 billion to 50 billion devices will be IoT enabled by the year 2020. 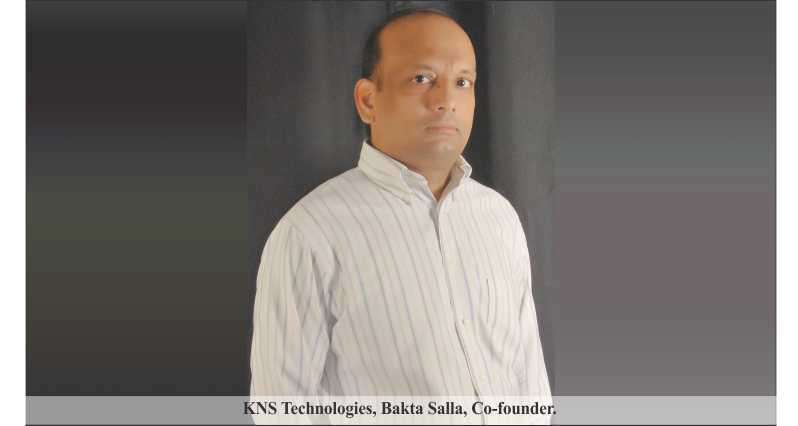 Bakta Salla, co-founder of KNS Technologies, is a solutions-focused Management Consultant with MBA, has over 23+ years’ progressive leadership in project management, client relations, and IT solutions for project management and data systems firms. Expertise includes business process redesign, mapping customer requirements, team building, designing, coding, testing and documentation of manufacturing and accounting applications for domestic and international clients in diverse industries. He is also oversees a team of highly motivated and dedicated engineers to deliver products that includes IoT based and Marketing automation solutions. KNS Technologies, pursuing from over two decades of IT consulting experience with Fortune 500/1000 companies, offers top notch solutions in the areas of CRM, Web content management systems, Cloud, Mobile & Analytics. Our proven expertise in these areas has landed us an opportunity to develop IoT based solutions to a major Realty company in the US. The solution helps in building “Smart” homes and commercial properties, that are equipped to offer Mobile based remote systems, such as online management of Energy metering and Billing services. IoT is not just restricted to Home Automation; it can be used in Digital Control Systems to automate process control and can be extended to Preventive Maintenance in manufacturing industries. There are already several large scale deployments planned or on-going deployments in cities like Songdo in South Korea and Santander, Spain to make it a wired smart city to manage resources with little or no human intervention. As India is also working on developing 100 Smart Cities, the opportunities are unlimited. Already established companies such as Google and Apple are investing heavily on IoT, Such established companies are buying out startups that develop promising IoT enabled devices. So what is in it for IT Startups and early stage consulting companies like us? Integrating 20 billion devices involves challenges that cannot be easily described from the lack of enough IP addresses (V4) to establishing standards; there is a humongous opportunity for nimble companies like ours.